GanttDiva has now added the ability to generate burn down or burn up reports from your project. 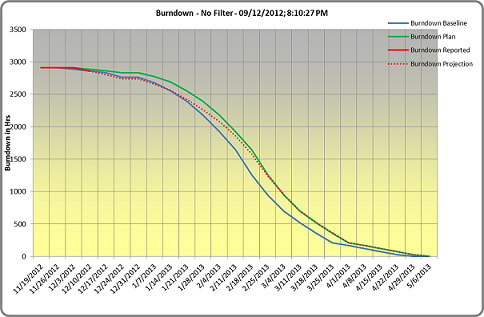 Burn down (or Burn up) charts represent a useful metric that can be used to track overall progress on a project. They give an up to date overview of overall progress of a project, based on the current reported physical progress of each task in the project schedule. Burn down charts are often useful for measuring overall progress and can also be used to predict when all of the work for the project will be completed. The burn down chart function in GanttDiva generates a plan curve that starts with the full number of budget hours in your plan based on the budget and shows your plan to complete all of this work. The generated curve is based on the budget, start and finish dates of every task in your plan and a calculation that physical progress for each task is evenly distributed across the task duration. The only difference between a burn down chart and an burn up chart is that the burn down starts at the full project budget and progresses to 0, whereas the bun up starts at 0 and progresses up to the full project budget. Earned value calculations based on reported physical progress are used to generate a view of overall reported progress for all tasks included in the current filtered view. A set of Project metrics, including Cost Performance Index (CPI) and Schedule Performance Index (SPI) can also be generated at any time from your project (user configurable). All information in the report is generated based on the current information captured in your schedule, so it is possible to make changes and then instantly re-generate your curve based on any updates.